Make sure you are operating your appliance within the safe operating range of 110 to 130 VAC. Some appliances overheat and are permanently damaged when operated above or below safe operating range. Easy to read digital display constantly shows outlet voltage in one volt increments. 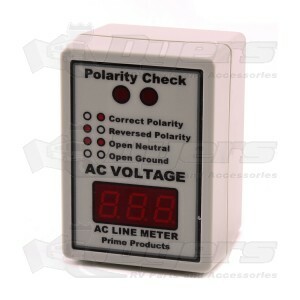 Built in tester alerts you to any polarity problems. LED display indicates if there is reversed polarity, open neutral or open ground. Bought 2 and built a 220v pedestal tester work great!